Gathering everything we have learned from the current and previous tests, we are redesigning both the Royal Continent and the Outlands. Rare mob camps with their own loot chests. Resource hotspots with Guardians to protect them. Dedicated faction raid zones in the form of home bases. Passages between regions, providing a faster but also more dangerous route. On top of working on this new content, it is important to note that we are continuously improving our level design tools, which allows us to make sure individual zones continue to become more unique and of better quality. First of all, it is important to make the world of Albion an immersive and believable world, one you can get lost in. Right now, this is not the case, as our world is very much like a grid or chessboard. We did not intend the world to be like this, but due to time constraints, it had to be created this way. As we are getting ready to implement the new world, we are first of all de-gridding the world, making it more natural. This includes several unique regions with defining landmarks such as lakes or mountain ranges. We will also introduce biome-based cities, each city having a unique layout and being different from the other. 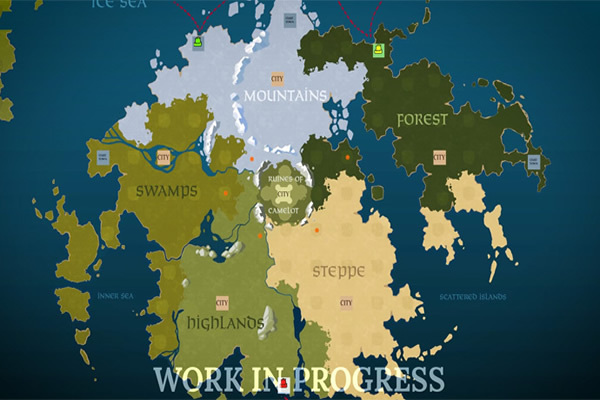 Aside from those changes, the world map is also being revamped. For example, we will add a better zoom option, allowing you to zoom out further and have better access to relevant information.